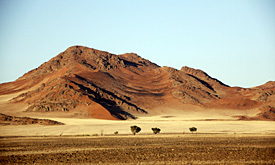 Travel from Windhoek across the rolling hills of the Khomashochland at an altitude of more than 2.000 metres above sea level, down the Gamsberg Pass into the Namib, which is the oldest desert in the world. The landscape varies from rugged mountains and rocky outcrops to sand-filled valleys and endless vistas of plains. After a short rest with lunch packs proceed through the Namib-Naukluft Park, where, with a bit of luck, one can see ostriches, springbok, oryx and Mountain zebras. rock formation which is millions of years old. Arrival in Swakopmund at about sunset. Lunch packs en route. Early morning start for a three hours drive in open vehicles on the premises of the lodge. Numerous pre-historic rockpaintings will draw you into the spell of mystic Africa. 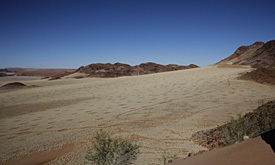 Afterwards proceed to the Ugab terraces. Dinner/bed/breakfast at the Toshari Lodge/Taleni Etosha Village or similar. and grass savannah. This type of landscape provides excellent opportunities for game viewing at the numerous waterholes or in the open countryside. 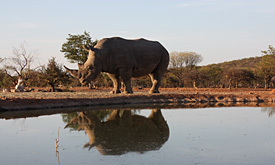 The Etosha Pan, which the park is named after, is approximately 6.000km² in size. In the language of the Ovambo people, Etosha means “place of dry water”, or “large white place”. Dinner/bed/breakfast at Toshari Lodge/ Taleni Etosha Village or similar. After breakfast proceed via Tsumeb and Otavi to the Gabus Game Ranch. En route visit Lake Otjikoto and the Mine Museum. 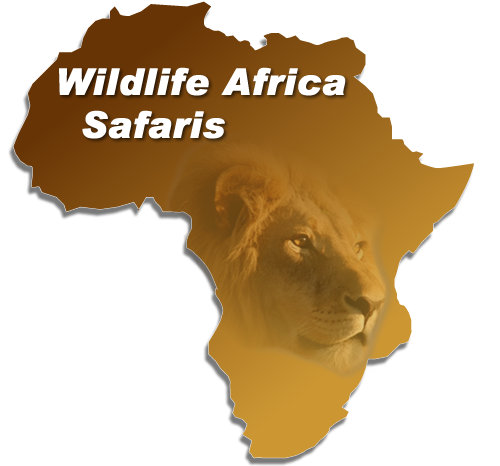 In the afternoon game viewing drive with sundowner on the premises of the lodge.